Hyundai Motor Co. is practicing its corporate social initiative in the Philippines by bringing in the first batch of Korean student volunteers for its Happy Move Global Youth Volunteers program. Accompanied by officials and representatives from Hyundai's corporate responsibility department, the student volunteers are participating in social contribution activities geared at helping families and communities at Malinta in Valenzuela City. Also present are representatives from the Korea Food for the Hungry International (KFHI) which serves as Hyundai's non-governmental organization partner for this project as they help coordinate and carry out the activities at the said locations. "Hyundai's Happy Move Global Youth Volunteers program expands Hyundai's contribution to the global community by nurturing the youth through enriching activities that promote a culture of sharing, compassion, and selflessness," said Hyeon-sook Heo, deputy general manager of Hyundai Motor's corporate responsibility department. "This program also serves as an opportunity for the youth of Korea to promote a viable exchange of culture that will help lead to a deeper understanding of our nations and the strengthening of partnerships in the global community." For the next two weeks, sixty student volunteers will devote their time, energy and inspiration in building and renovation activities at Pinalagad Village and Dulong Tangke Village in Barangay Malinta, Valenzuela City. For Pinalagad Village, the program aims to build 10 houses for the most underprivileged families, renovate and extend the toilets of Pinalagad Elementary School and conduct a hygiene awareness educational campaign for the students. For Dulong Tangke Village, volunteers will build a cement access road to the village and install public toilets to promote a more hygienic environment. "We sincerely thank Hyundai Motor Company, the student volunteers from Korea, and representatives of the KFHI for conducting the Happy Move program here in the Philippines," said Fe Perez-Agudo, president and chief executive of Hyundai Asia Resources, Inc., the official distributor of Hyundai vehicles in the Philippines. "Their message of hope, as concretized through the activities that will be conducted in this program, resonates our continued confidence in our countries, Korea and the Philippines, to remain united in the pursuit of a better future for our nations." Hyundai Motor's Happy Move Global Youth Volunteers program was launched in 2008 and is now on its fourth year of bringing hope and happiness to communities across the globe. 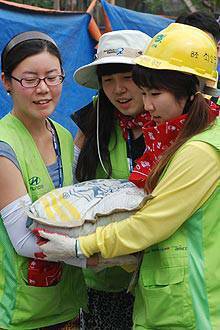 Each year, a total of 1,000 student volunteers from South Korean universities join the program in various locations every year. Since its launch, 3,000 students have been a part of Hyundai's Happy Move Global Youth Volunteers.